Big news for all those of you who need Unicheck for individual use. You won’t be asked to prolong or buy a subscription plan again. 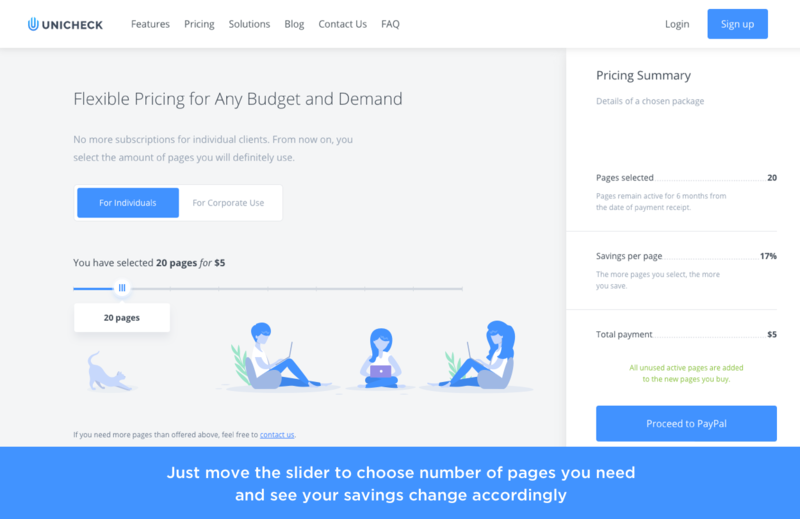 Now, with new fair pricing you choose the exact amount of pages you need without annoying recurring fees. We’ve gathered a lot of customer feedback to ensure that this updated pricing will meet your expectations. We focused on turning subscription model into something more flexible, because we want you to make all the choices when it comes to your experience with Unicheck. Now let’s get deeper into detail and see what changes occurred and why Unicheck is getting even more beneficial to you. We discard the old subscription pricing model for individuals. No more time spent for cancelling, rebilling or dealing with pending or declined transactions. A new simple and fair pricing will help you save a lot while Unicheck will keep on delivering the same superior service quality. For now, everyone can check 5 pages absolutely for free and see how the checker works. Now you may select a certain number of pages according to your own needs and budget and always stay in control of what happens. The moment you land on the updated pricing page for individuals, you will see the slider. By moving it to the right, you can choose the number of pages you require. As you slide, the data provided in the pricing summary will be immediately updated. It will prompt you how much you will save per page and what payment is due. No matter how many pages you select, they will stay active during 6 months. What’s more, all unused active pages will be added to your account once you decide to order more pages. The bigger the number of pages selected, the bigger is the discount per page check will be. And just as it was before, all Unicheck’s powerful updates become available to all individual users once they are launched. With a new flexible pricing model adopted by Unicheck, you can pay for pages you use without being obliged to prolong subscriptions. Today every user can try Unicheck for free, select the suitable page count and enjoy all powerful features of the checker in the new, recently updated user dashboard. How to Spot a Freshmen During Midterm Week?